Not sure how to create a WordPress website? No worries—we’ll walk you through it. If you’ve never done it before, creating a WordPress website can feel more than a little intimidating. But don’t let that feeling scare you off; in terms of customization and control, you can’t find a better platform than WordPress. Fortunately, with just a little know-how, building a WordPress site becomes very doable. In this article, we’ll show you exactly what we mean as we walk you through the steps of building a small-business website with WordPress—from planning your site to putting it on the web. Whether you’re starting a recipe blog, an online store for punny t-shirts, or just a simple website for your pet grooming service, we’ve got you covered. A little preliminary work on your part can make the website building process go as quickly and smoothly as possible. So before you build your website, make sure you’ve got everything in order. Begin by choosing a domain for your website. In most cases, you’ll probably want this to be similar, if not the same as, your business name. You might want to think of a few variations, though; when you purchase a domain name (in the next step), your exact business name might be unavailable. So brainstorm a list of possible URLs. Next, make a list of things you’ll need on your website. This can be as basic as deciding you want a home page, about page, and contact page. But for maximum usefulness, you can also list specific features you want—whether that’s a hamburger-style navigation menu, a sticky top menu, or an online store (or all three). Deciding on your needs now will make it much easier to find the right themes and plugins later. Not sure where to start? Take some time to browse the websites of your favorite businesses. What works and what doesn’t? What elements on their pages would be great for your site? List everything you need, and keep that wishlist in mind when you choose your themes and plugins. WordPress can feel challenging to pick up, especially if you’ve never built a business website before and you’ve never worked in web development or marketing. If you prep your assets (like text and images), beforehand, you’ll have less to juggle during the actual building process, meaning you can focus on actually learning the software. You can also start gathering all the assets you’ll need for your website. For example, you might find some stock images that you can use, or you can start writing the text for each page. Again, this helps the actual building process go faster later. This is also a good time to make sure you’ve taken care of all the legal legwork for your business, like getting a business license and a tax ID. If you want to speed up the process, you can use a filing software like BizFilings. With your prep done, you can start setting up your website. First, you’ll want to finalize your domain name. If you already brainstormed a few ideas in step one, you can use that list to see what URLs are actually available. To do this, go ahead and choose a domain registrar, then search for available domains there. Most registrars will even give you a list of similar URLs you can choose from, in case your desired one is unavailable or too expensive. If you’re lucky, you can snag [yourbusinessname].com. But if you can’t, don’t despair. You can always find solutions like including your city name or an article like “the,” or you can use less common domain suffixes like .store or .online. We recommend using Bluehost as your registrar, since it offers both domain registration and top-notch WordPress hosting (more on that in the third step), but you have plenty of other options for domain registrars, including well-known companies like GoDaddy. Of course, choosing your domain registrar won’t lock you into using the company for other services, like hosting. But it does make it easier if you have to keep track of only one username and password to manage your website, rather than several. Either way, once you have a domain, you can work on finding hosting. Before we get into finding the right web hosting service for you, let’s review what hosting even is. Basically (emphasis on the basic), if your domain is your street address, the building (the web space) at that address is owned by your hosting company, and they’re leasing it to you. All your stuff—your actual website—is inside the building. Again, that’s a gross oversimplification, but what it essentially means is that you need a web host so your visitors have an actual website to visit—not just a web address. As we already mentioned, many domain registrars offer web hosting too (like Bluehost and GoDaddy). So you can always choose to go with the same company for both, or you can check out our list of the best small-business website hosting out there. Some hosts offer extra perks, like free email addresses at your domain or AdWords credit. While you probably shouldn’t choose a web host based on those extras alone, they can help you decide between two similar hosting companies. If you get your domain and your web hosting from different companies, you’ll need to make sure that your domain actually points to where your website is being hosted. This requires you to update your name servers. We know, it sounds complicated, but it really isn’t. Any domain registrar worth its salt will have a tutorial to walk you through it (here, for example, is Bluehost’s), and it really just requires some copying and pasting. But if you choose a host with one-click installation (and honestly, most of the big hosts offer it), then at least you won’t have to worry about installing WordPress yourself. Instead, you should find a convenient link from your host that allows you to get started in your WordPress dashboard. Once you get into WordPress, you’ll want to start customizing by choosing a theme, or template, for your website. Remember back in step one when you listed features your website had to have? Here’s where you can break out that list again to help you find the right theme. WordPress itself offers plenty of themes, which you can filter by features or layouts. Clicking on a theme will give you more details about the theme, including its unique features and support options. If you see a theme you like, you can install it with just one click and then start editing. But while WordPress has a lot of themes, they’re not all winners. If you want something different, you always have the option of uploading a theme that you either created or purchased elsewhere. We like ThemeForest as a source for feature-packed, well-designed WordPress themes. Its themes start as low as $19, and the vast majority cost less than $100. That’s much easier on your budget than hiring a designer; plus ThemeForest themes come with templates and features specifically for certain types of businesses, which means you can save time on trying to edit a default WordPress theme to your liking. For example, the BoxShop theme provides several high-impact layouts for ecommerce sites, letting you change everything from product layout to top navigation to drive sales. Mommy bloggers might prefer the Admania theme, which makes it easy for ad-driven blogs to fold ads into their layout and get visitors clicking. And the Dendrite theme has all the building blocks creative types and freelancers need to showcase their portfolios. And if you want something truly one of a kind to make your website stand out from the competition, you can always get a custom WordPress theme. For example, 99designs lets you describe what you want in a theme and then choose from several designer submissions. Of course, a custom theme will cost you a bit more (99designs starts at $599). But if a high-quality website will help you convert more users into customers, that investment might be worth it. Wherever you go to get your theme, just make sure to choose one you actually like. While you certainly can change your theme later, you’ll save yourself a world of inconvenience if you start with the theme you intend to use. Otherwise, you’ll have to do all sorts of tweaking and troubleshooting when you change your theme later in the building process. With a theme in place, you’re ready to choose some plugins. These will increase your website’s functionality. Again, we suggest referring to your previous list of website needs to decide exactly which plugins you’ll need. No matter what, you’ll probably want to install Jetpack. If you chose a WordPress host with one-click installation, Jetpack might come pre-installed for you. That’s because it’s one of the most essential WordPress plugins. Jetpack can do a lot for your website: it gives you basic stats about your website traffic, helps protect your site from attacks, improves your site’s speed, and filters out spam comments. It also includes features that can do everything from checking your grammar to adding links to related posts at the bottom of your blog posts. And that’s only the free version. The paid version gives you access to more SEO (search engine optimization) tools, backs up your website periodically to preserve your data, and connects with Google Analytics to give you a more in-depth view of your website’s traffic. Whether or not you plan to use all of Jetpack’s features, you’ll probably like at least some of them. So definitely plan to install this powerful plugin. But Jetpack is just the beginning; you have plenty of other options for plugins. You can browse through lots of them in WordPress (under the “plugins” tab, unsurprisingly). As with themes, you have thousands of options. We’ll just highlight a few of the most useful. If you’re creating an e-commerce site to sell your dinosaur-themed vinyl vehicle decals, you might want to get WooCommerce. This free plugin provides you with all the ecommerce features you could need to do things like accept payments or manage your inventory. It also offers additional extensions, many of which are paid, that give you extra features for your online store, such as shipment tracking. If you’re more interested in getting as many eyes as possible on your food blog, you might want Yoast. Yoast gives you access to just about any SEO feature you could want, which will help potential customers find you via search engines. And if you want to stay in touch with your customers, you can also get plugins to help you with that. WP Live Chat lets you embed a chat box on your website, so customers can chat with someone at your business as they browse. WPForms helps you create interactive forms, perfect for getting visitors to sign up for your newsletter. Keep in mind, those are just a few of your options—you have thousands more plugins available, and more get released all the time. With a theme chosen and plugins in place, you can get down to the actual building process. Precisely what this will look like depends on your site’s purpose, your theme, and your plugins, but there are a few general steps that should apply to most websites. First, you’ll want to customize your site’s appearance (under the “Appearance” or “Customize” tabs). You can change basic things like the default text typeface, size, and color, as well as more advanced settings like the appearance of your navigation menu. Once you’ve got your site looking how you want it to, you can start adding pages. You can either use the layouts provided by your theme or build a page from scratch, using WordPress’s block builder. These blocks include common layout elements (like text plus an image or three columns of text) to simplify your building process. With your basic pages complete, you might want to add a blog. The blog-building process is pretty similar to building pages, down to the ability to use building blocks. The difference? 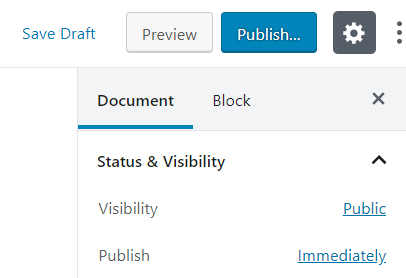 You’ll be working under the “Posts” tab instead of the “Pages” tab, and WordPress will automatically update your blog page as you publish posts. And speaking of publishing, don’t forget to do just that. Your WordPress site won’t go live until you press the publish button. So whenever you’re ready to launch your site, press that button to finish up. If all this sounds a little too complicated, or if you run into some roadblocks, don’t hesitate to get some help. We all need a hand sometimes—especially with WordPress. In some cases, getting help might be as simple as asking a question on the WordPress forums. They’re full of people willing to help you with questions, from the basic (How do I install WordPress?) to the niche (How do I change the spacing in my top navigation menu on the Sela theme?). But sometimes, you may need more specialized help. If you get really stuck, consider hiring a WordPress developer to do some or all of the work for you. While it might seem cost prohibitive, can you really afford to spend hours upon hours troubleshooting WordPress yourself? Hiring some help can get your business site up sooner and get you back to work—maybe not a bad return on your investment. If you don’t happen to know any developers, you can always use Upwork to find a freelance developer. Great question. Put simply, WordPress.org is a software; WordPress.com is a service. Less simply, WordPress.org is an open-source software used to create and manage websites. Thanks to its open-source status, you can download and use WordPress for free. You can use WordPress with lots of different hosts, and you’ll find hosting companies that offer managed WordPress hosting (hosting accounts that take care of the more technical parts of WordPress, like optimizing site speed and installing updates). WordPress.com offers web hosting services and the use of WordPress the software in one convenient package. Its lower-tier plans do limit WordPress’s capabilities (you can’t install plugins, for example), but high-tier plans like the Business plan give you pretty much all the capabilities you’d get from using WordPress on a different host. You might even think of WordPress.com as a managed WordPress host. That’s all you really need to know to sound smart at parties (assuming you go to parties where people discuss how WordPress.com compares to WordPress.org). But if you want even more details, you can check out our full breakdown of WordPress.com vs. WordPress.org. Is building a website with WordPress as hard as everyone says? Kind of, yeah. If you’ve never used it before, WordPress often feels confusing and complex. Editing options aren’t always where you’d expect on the menu, and the visual editor isn’t nearly as easy to use as a drag-and-drop builder like Wix or Squarespace. At the same time, most WordPress users can master the platform. Including you. Sure, you might have to do some googling and ask questions in the support forum from time to time, but there’s no reason you can’t become an expert WordPress user. Now as to whether or not you want to invest that much time into learning how to use WordPress? That’s another question entirely—one only you can answer. But if you’re willing to invest some time and effort, then WordPress does offer greater control and flexibility than just about any other website builder. Plus, with thousands of plugins, you can make your WordPress site do just about anything. And if that end result matters more to you than how much time you spend, then WordPress sounds like a great choice. Here’s the good news: now that you’ve read this article, you’re one step closer to creating your own WordPress site. You know the essential steps to get your site up and running on the web, and you even have some recommended tools to use. And if creating a website with WordPress still sounds too intimidating, no worries; you can always check out our favorite website builders to find a site building platform that’s more your style. At Business.org, our research is meant to offer general product and service recommendations. We don’t guarantee that our suggestions will work best for each individual or business, so consider your unique needs when choosing products and services.